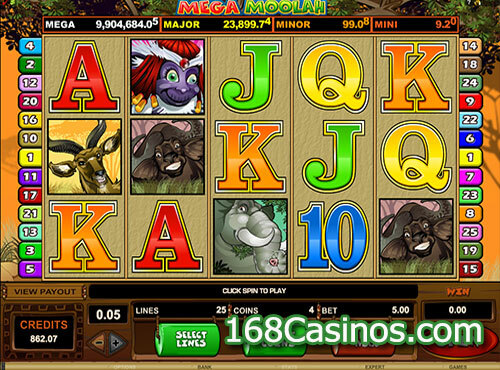 Mega Moolah Slot undoubtedly is the big daddy of all progressive slot games we have ever seen in online casino history. Despite having been in the leading space for ten long years, it is still one of the most rewarding progressive slots which is admired by countless fans every day. The most distinguished feature it has the four progressive jackpots which can change the life of any lucky player as they have done in the past, in fact, this slot has the Guinness World Records of paying highest money out of a win to a player through its progressive win. If we talk more about this highly acclaimed slot game, Mega Moolah Slot is five reels online video slot with descent audio visual appeal. 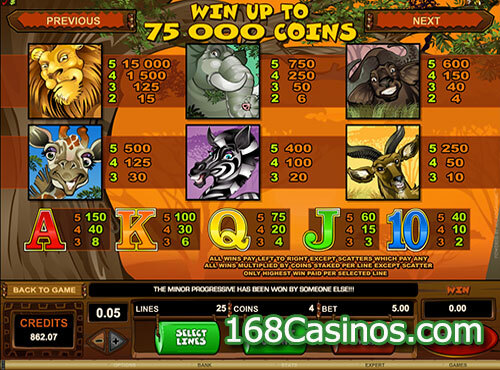 Since Microgaming, the developer of the game, was only wiling to weight over its rewarding features, it did not take care of three dimensional visuals or digital sound support even then it has a bright and griping visual appeal with pictures of animals on the reel matrix along with other regular alphabets. Honesty speaking, the most important part of the home screen is its top most row which mentions all the four jackpots current pool size which keeps increases with each bet any player places on it and not to mention other screen elements have their equal importance too. Since, it is a twenty five lines online slot, it is within the range of most of the slot players and coins value is also kept minimum so more and more players could enjoy its gameplay without worrying about the bankroll size. Anyways, apart from the top most row and reels matrix, bottom area is where all the navigational options reside as it has all the options any player needs to pick for initiating the roll. Apart from this, any player can wager from one to five coins per line and coins value can also range from 0.01 to 0.05, which can be regulated by clicking the +/- button in the lower left corner. To access it Auto Play option, you need to enter into its Expert Mode by hitting the same tab on the home screen. Like other Microgaming slots games, this one also has several additional helping features which motivate players keep playing and few of them are obvious Wild and Scatter symbols that work in their natural way along with a big bonus round which is the USP of this slot. 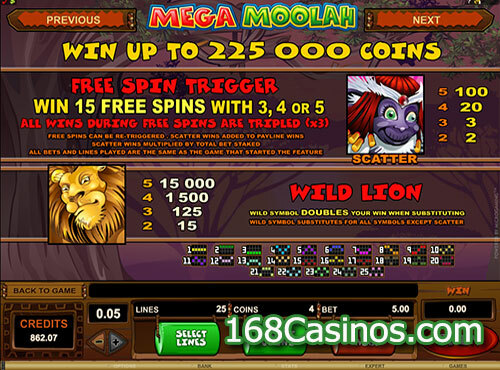 The scatter, which triggers up to fifteen free spins if you have it for more than three times on the landing screen, is represented by the Monkey symbol and the wild card featuring a Lion Doubles and it helps you complete a winning combination by substituting non matching symbol except scatter. 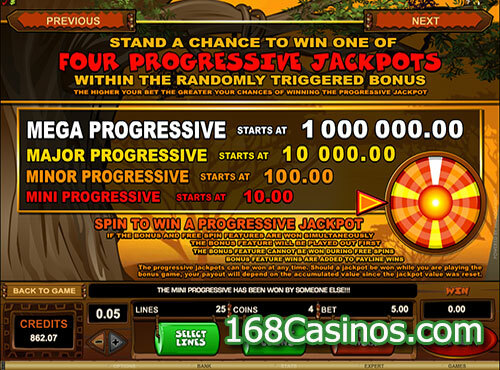 There is also a randomly triggered bonus round wherein players can win one of the 4 Progressive Jackpots. In this round, a spinning wheel uncovers which Jackpot they have won. The four Mega Moolah progressive jackpots are the Mega Progressive Jackpot, starting at 1,000,000 credits; the Major Progressive, which starts at 10,000 credits; the Minor Progressive, which begins at 100 credits, and the Mini Progressive, which awards players 10 credits.